Sludgebusters offers the highest value in San Diego residential septic tank services. We have more than 30 years of experience performing high quality septic tank pumping, installation, repairs, septic tank location, and septic system certifications and inspections at very affordable prices. Our highly skilled technicians have serviced 1000's of septic systems for our satisfied customers, always adhering to the highest standards of professionalism in their work. We are licensed, bonded, and insured, and all of our repairs and installation work is performed in compliance with the Universal Plumbing Code (UPC). In addition, we always pull all necessary work permits on behalf of our customers. If you have concerns about the health of your residential septic system, for example, if your toilets are not flushing properly; your sink, shower, and tub drains are draining too slowly or backing up; you notice foul odors; or dark spots are appearing in your yard near the septic tank: Call us and we will be happy to come out and troubleshoot your problem. And if you are unsure of exactly where your septic tank is located, we will use our state-of-the-art, electromagnetic tank location technology to find it. In addition, there will be no charge for our location services if we also pump your tank during our service call. Please feel free to call us with any septic system concern at all. And if a true emergency arises, we are on call 24 hours a day, seven days a week to expertly diagnose and repair your septic system problem. What differentiates a holding tank from a regular septic tank is that there is no system extending beyond the tank itself. For this reason, holding tanks are generally used only on a temporary basis to contain effluent, sewage, or runoff under RV trailers or adjacent to temporary structures where permanent facilities are not or cannot be in service. Holding tanks are constructed with capacities ranging from 300 to 10,000 gallons, and can be manufactured out of a variety of materials. Sludgebusters pumps and thoroughly cleans holding tanks, and can also provide these services for your recreational vehicle. Plastic tanks are also called poly or polyethylene tanks, and feature a ribbed surface with squared ribs spaced 4" to 6" apart. These tanks can be yellow, gray, blue, or black, and contain two circular lids, which have a 22"-30" diameter, and are spaced 4'-9' apart. Typically, instructions upon the lid of these tanks will advise their owner to refill with water upon pump out, as this water will help the tank to retain its shape. Pictured above is a NORWESCO polyethylene tank. NORWESCO septic tanks are backed by a full three-year warranty and have been certified by state and local health departments from coast to coast. Where applicable, NORWESCO septic tanks have been certified by both the IAPMO (International Association of Plumbing and Mechanic Officials) and the CSA (Canadian Standards Association). The lids on these tanks are often attached to the tank by four small screws, which must be unscrewed before lid removal. FRALO tanks meet or exceed all septic tank requirements throughout North America, and are covered by a fifty year warranty. 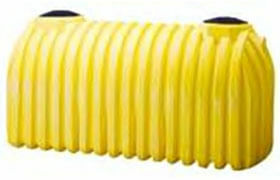 FRALO tanks do not require backfilling with water upon pump out. In addition, both FRALO lids and risers are threaded, and must be unscrewed before removal. Like plastic and polyethylene tanks, fiberglass tanks are also ribbed, but these ribs are rounded and can be spaced at intervals of up to 12" apart upon the tank's surface. These tanks have domed or dished lids measuring 22"-24" in diameter, and which are 4'-9' measured center to center. 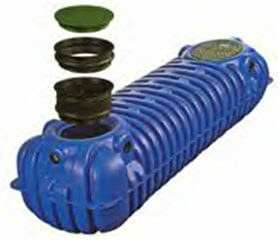 In addition, the tanks manufactured in 2003 and afterwards have screw-down lids. shown below the unit runs out to the leach field. 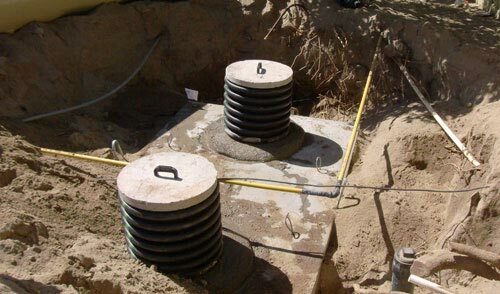 Concrete septic tanks typically have two square-shaped or round lids which measure 22"- 24" in diameter, 5' center to center, and have steel rebar, steel cable, or plastic handles attached to them to facilitate installation. Newer model homes, constructed after 1994, will commonly have round lids which are 18"-24" in diameter, and are spaced 5' to 8' apart. Concrete tanks installed before 1970 were often constructed of block or brick, and had three lids, one per compartment, that were poured or built in place, and which varied widely in size and shape depending upon the septic tank manufacturer. 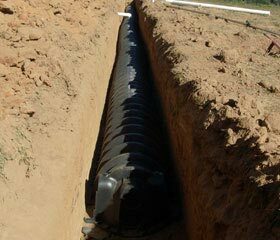 Drain fields, leach lines, leach fields, seepage pits, and cesspools are all methods of water absorption into the soil and are all gravity fed systems. However, in some cases, when the septic tank is located lower than the drain field, a pump chamber may be placed in-line between the tank and field, which feeds a surge tank above the field, in this way facilitating normal gravitational function within the system. One of the oldest types of systems, it consists of a 3'-4' deep trench, 18" wide, containing a 12" deep layer of rock added as a base for the pipe. A 6"-8" of rock is then poured into the trench over the pipe to hold and surround the pipe. A modified trench, used as an alternative, can be up to 36" wide, and have 36" or more layer of rock placed below the pipe. This modified version provides a more efficient system when space is limited. The trench will then be covered with butcher paper or straw to keep soil out of the trench upon backfill. This rock and pipe system can measure between 375-2000 lineal feet, depending upon your house size and soil type. Infiltrators are black plastic chambers and have an open flat bottom with louvered sides that are designed to keep dirt out. They require a perfectly flat-bottomed, 20" wide trench for installation, and come in 4'-8' lengths, to be assembled in the open trench. 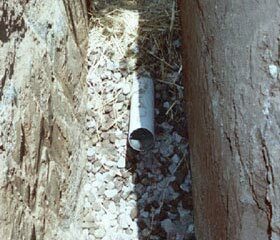 Their manufacturer claims that they are more efficient than rock and pipe, but the San Diego Department of Environmental Health has the same linear footage requirements for the system as it does for rock and pipe. Seepage pits are excavations which contain perforated, 4'-5' diameter concrete cylinders which sit upon a bed of crushed rock. These systems are most commonly used in sandy soils where trenches will silt in, or where space is very limited. A "stack" consists of two of these cylinders, and most homes built upon sandy soil require only two stacks. However, in decomposed granite or rocky soil, the use of 15-30 or more stacks may be required for a single residence. Cesspools are no longer legal in San Diego County. 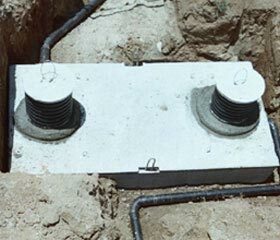 They are tankless drain areas supported by rock, block, or brick, in which the tank and the field are integrated into a single hole. They are environmentally contaminative due to their design.